I ran stupid and now I’m paying for it. A painful reminder of how I am not as young as I used to be. It was a beautiful, chilly and cloudy morning. Perfect for running. Although not so much for standing around outside waiting for the start. My hip had been bothering me a bit for the past week. Nothing major, just on the brink of feeling strained. It usually worked itself out a couple a minutes into a run. I wasn’t running this race alone. My brother and his wife were in it (they were both training for the NYC marathon, his second marathon, her first marathon, and first half marathon race). A family friend was running his first half marathon (only after starting running last year!). A co-worker buddy who ran the Riverside 5K series with me was also running his first half. The half marathon distance is my favorite, so I had a bit of pride on the line and there might have been a little trash talking involved. My other brother also suggested an over/under bet, where I’d finish behind my co-worker by 3 minutes. So, I had a 3 minute gap to either maintain or close. So, instead of running my own race, I ran a stupid race. I started out too fast, covering the first 7 miles at about an 8.30 minute/mile pace. For reference, I ran my fastest 5K at about an 8.22 minute/mile pace. After 7 miles, I broke down and those last 6 miles were miserable and beyond difficult both mentally and physically. The race is run on the Bronx River Parkway between the Westchester County Center and Scarsdale Road. It is rolling hills trending downhill to the turnaround, then it’s rolling hills trending uphill back. Do-able, but not without a few good challenges (especially on the way back). The course is quiet since it isn’t very spectator friendly. The only gripe I have is how the finish line is placed. In the last maybe 200 meters, you have to make a sharp U-turn before being able to sprint through the finish chute. It just robs you of any momentum from a finishing kick. Nevertheless, I ran out of gas at mile 7, and pushed myself through to the finish. I did manage to finish in under 2 hours, which was something I haven’t done since I PR’ed on the same course in 2009. That makes up for finishing 3 minutes and 34 seconds behind my co-worker. 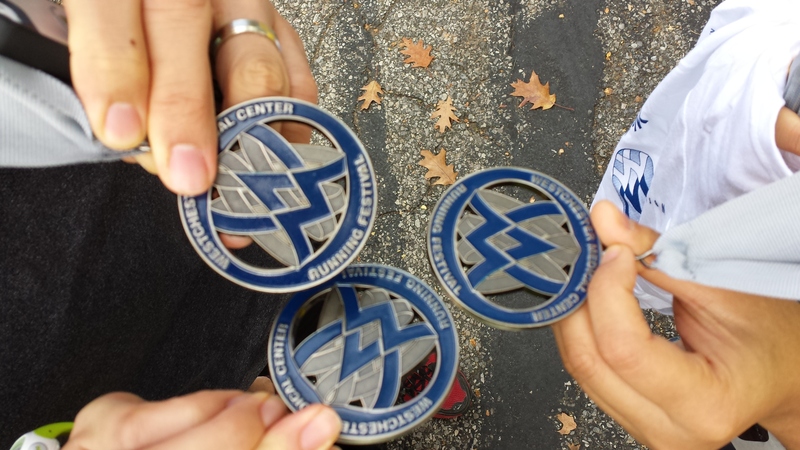 So, congrats to my newly minted half marathoner friends!! I hope to see more of you around the circuit come spring time!! Keep running! This entry was posted in Running, Uncategorized and tagged Race report, Running, Westchester Half Marathon. Bookmark the permalink.